Over the long Chinese New Year weekend some time last month, I managed to catch a sneak peek into the behind-the-scenes of Genggam. So you must be wondering – what the hell is Sham talking about, Genggam? Genggam bara biar sampai jadi arang? No. Genggam is the first ever official short film under the Sinema Incubator Programme produced by Singapore Malay Film Society (SMFS) and Rezzaruction Pictures. Genggam (Fist) is directed by SMFS’ very own founder, Isnor Dzulkarnain Jaafar. I was cordially invited to the last few days of shooting, which started sometime near September last year, to witness some of the chaos and excitement going around the shooting location. Speaking of which, I got a shock of my life when I arrived at the (top secret) shooting location. A boxing ring was the last thing I had in mind, but thankfully, I was comfortable in my sneakers and technically it was more of a martial arts training facility. The temperature was scorching hot and I was stupidly wearing black and with layers. But hey, that’s the fun and rigour of making a film! On the first day of shooting for that weekend, I chanced upon Ashmi, Netty and Cik Kamin doing one of the scenes when I arrived, and I must say I am impressed by the director of photography. Although I couldn’t see quite well through the small monitor supposedly for the director, especially from where I was standing, I could see that Ghufran (the Ghufran I’m referring to here is Ghufran Jasni, not Darul Ghufran Mosque) seems to know what he was doing. One of the scenes in Genggam. Later in the day, I managed to talk to Cik Kamin who plays one of the antagonists in Genggam. A real-life silat guru, Cik Kamin believes that silat should be revived by our own race and not others. Having international students from as far as France studying the martial art of silat with him, Cik Kamin is naturally disappointed with the local community for neglecting silat in favour of other forms martial arts like taekwando. “The traditional form of silat is increasingly being abandoned by the young generation. Combat silat is now more popular because many fear the symbolism behind traditional silat. As the saying goes, people fear the unknown,” Cik Kamin commented. A very glam photo of Cik Kamin. The next day, I caught up with Fatmah Abdul Halid, another one of the antagonists, yet again (I seem to love antagonists, eh?). 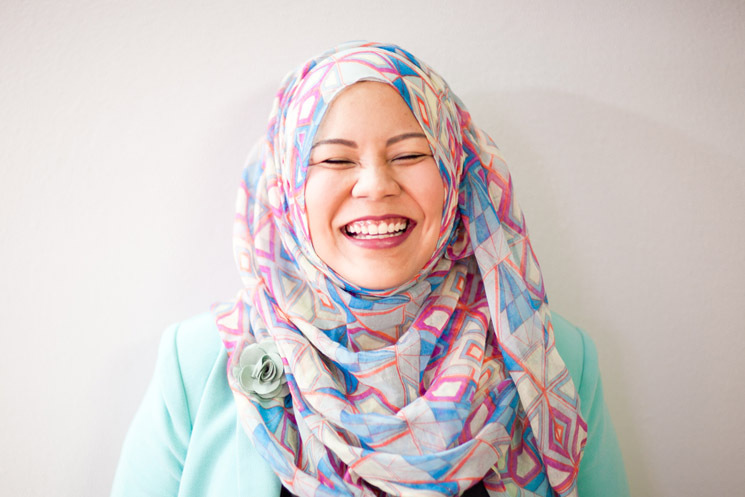 An executive in a the IT industry by profession, Fatmah began practising silat in her teens. She later moved on to competitive silat where she represented Singapore in the Southeast Asian (SEA) Games for several years, and finally achieving a Gold medal in the 2007 Womens’ Open. Despite her background in silat, Fatmah claims it was difficult for her to repeat her success in front of the camera. Her first time in front of a camera meant that she had a lot to learn – especially with veterans like Rafaat Hamzah and Zamberi Abdul Patah around on set. A worn out but determined Fatmah. “As a first time actress, there is no way for me not to be nervous. I had to visualise the scenes in my head over and over again. I cannot make any excuses for not being able to perform my best. My fighting and acting skills must be excellent for Genggam to be an impressive production,” says Fatmah. Suffian and the two commentators posing for a picture. There is no way I can deny the togetherness and spirit to make Genggam a success, though. Despite running late from the planned schedule, and everyone looking tired from all the running about, the crew still managed to spare the other journalists and I some time to joke around. Shahida made sure we had our lunch and made us feel part of the production (although we were there only to kepo-kepo around). Isnor giving the crew some words of wisdom. I can’t release the synopsis just yet, but watch out for another entry nearing the release date of Genggam some time in May! I am really excited for the screening, in line with the first anniversary of SMFS. To learn more about SMFS, click here, or join our Facebook group.